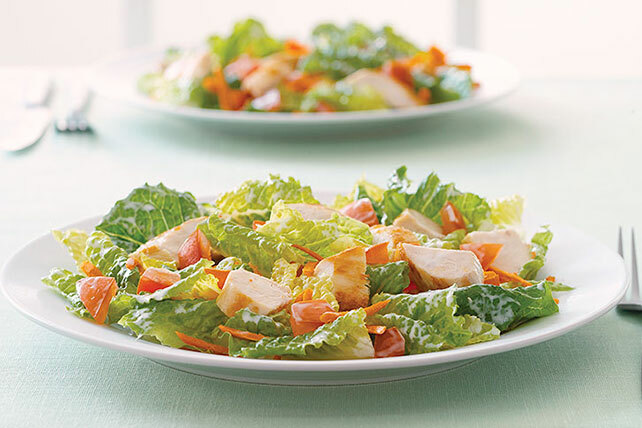 Garden vegetables and tender chicken give this lovely salad all the deliciousness it needs. Although the creamy ranch dressing makes it all even better. Toss salad greens with chicken, tomatoes and carrots in large bowl. Divide evenly among 4 individual serving plates. Spring is in the air! Welcome the warmer weather by serving this colorful main-dish salad that provides 1-1/2 cups of the recommended 2-1/2 cups of vegetables per day. Prepare as directed, substituting 2 pkg. (6 oz. each) OSCAR MAYER CARVING BOARD Flame Grilled Chicken Breast Strips, chopped, for the chopped cooked fresh chicken and using KRAFT Lite Ranch Dressing.